When I was young I use to play a lot of games. Zelda was my favorite, and I was better at it than all the boys in my family. When I dreamed, sometimes I would dream I was in the body of Link, the playable lead male in all Zelda games. How weird it was to wake up and realize such a divide: my body a girl’s but in my dreams, fighting monsters to save the world, in a boy’s. Now, I’m playing fewer games and spending more time writing. Writing in academic genres of course. Those that will eventually fulfil the requirements of a PhD and allow me to continue work as an academic. When I write, sometimes I still feel like I’m being folded into another body. I understand all too well how the academic world I participate in has been strategically arranged to support the movement of certain bodies, certain ways of living, and and certain ways of being at the expense of others. And because of this, I’ve always felt an uncomfortable disconnect between my body, my experiences, my patterns of thought and the demands and expectations of traditional academic writing. I say this all, of course, while acknowledging the many privileges that come with my white and abled body. As I’ve adapted to the goals of academia and academic writing, I tell myself the same advice we tell our students: we learn a discourse through participation. We develop identities through this participation. But even with this, I’m often left weary. Weary not only from trying to adapt, but also from how the goals that lead to academic success are often entrenched in institutional patterns that reproduce the same injustices we claim to be fighting against. I write about these personal divides not just because. But because I hope for these personal anecdotes to make the significance of what follows more clear: this is, after all, a Web-text of the Month. And what I’m really here to talk about is NYMG: Feminist Game Studies, an inspiring new journal that recently published its first issue. It’s important to know some basics about NYMG. The journal is part of the larger work of Not Your Mama’s Gamer, a blog launched by Samantha Blackmon and Alex Layne in 2011. The first issue contains content by three primary authors and a letter from the editor. I withhold using the term “article” or “chapter” here because of how those terms carry certain conventions or associations that don’t necessarily fit with what is going on in this first issue: for example, Lauren Woolbright and Marie Jarrell’s “Framing The Blood of the Vampire” includes a playable text-based game and its critical framing. And Adrienne Shaw’s “Are We There Yet? : The Politics and Practice of Intersectional Feminist Game Studies” is a video adaptation of a keynote delivered at the 2017 Critical Game Studies Symposium. While I was familiar with the content published on Not Your Mama’s Gamer, when I heard about the addition of a “journal” I made certain assumptions that the journal would be more traditional in terms of its content, voice, and style. I don’t mean to suggest that there aren’t journals out there working to radically reconstruct academic genres: they are out there. But most often after reading a new journal issue, I’m left with a feeling of wanting-something-more. The night I spent reading, playing-through, watching, and listening to the new NYMG, I felt something different. The content was brave, honest, impactful: intersectional feminism that inspires intersectional feminism. And it was a pleasure to experience. What that first issue made more clear for me, was that both the world of gaming and the world of academia struggle with a shared problem in that they have histories that privilege white, straight, and masculinist forms of being and seeing. One only needs to Google “Gamergate” or read the responses to the 2019 CCCC CFP on the WPA listserv to be reminded how how these ideologies stick. 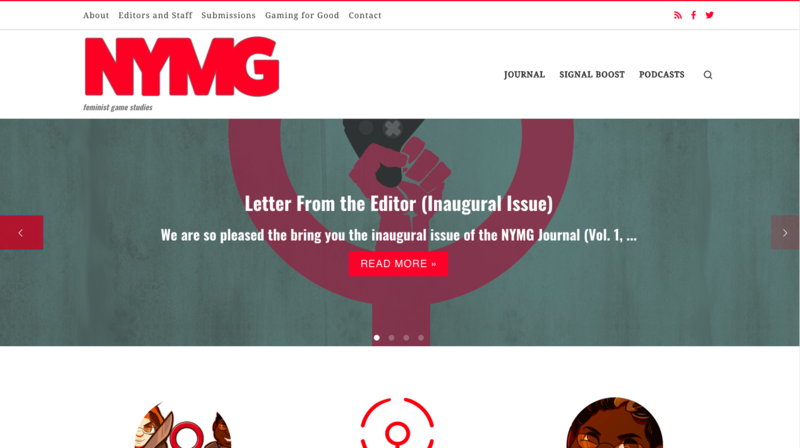 The first issue of NYMG actively works against problematic and sexist representations in video games; additionally, it invites a consideration of what it might mean to work against the problematic and normative conventions of (most) academic writing. In my own research, I’m interested in how material processes, digitality, and community collectively work to shape our composing practices. I’ve spent time trying to name the affects that particular mediums create: “What is it about this that generates [ ] forms of feeling?” “What work goes into this?” It was natural, then, to want to know more about the behind-the-scenes decision-making that goes on at NYMG I reached out to the editor, Samantha Blackmon, who was gracious enough to share her time with me. It was through our phone conversation that I realized in writing this review, I had two missions: (1) (the more obvious) I want people to know about and read NYMG and check out the first issue and see what’s going on. And (2) (the less immediately obvious) I want to better understand how feminist-informed digital composing and publication processes may work to ethically disrupt the conventions of academic genres. While a traditional journal review process often includes 2-3 blind reviewers (sometimes leading to different or even contradictory feedback for a composer), Feminist Game Studies values a transparent and collaborative review process for both reviewers and composers. Blackmon explained that as editor in chief, she typically gives content the first look over to generally see if it fits with the theme and purpose of the journal. Then, the content is passed on to a small group of editors with various levels of expertise on the subject. (During this review process, the content creator remains anonymous.) Although this small group is assigned to provide feedback, the entire editorial board is welcome and able to give feedback to any piece they like. And while NYMG isn’t the only journal to develop a review process based on feminist goals of transparency and collaboration, it may be productive to consider how such aims may connect more largely to the ethics of academic publishing and especially to how it supports newer scholars in the field. One of the aims Blackmon had for NYMG was to create a journal where academics didn’t just look at other people (those outside of academia) and write for other academics, but instead actively created with them. This process was rooted in the belief that the intersection of scholars with critics, bloggers, gamers, and game developers would provide a richer, more full picture than what would have been available without those intersections. The first issue offered one glimpse of what this may look like through Green Willow Games creative director Elizabeth Ballou’s critical review of Witcher 3, which ended with a call directly addressing Witcher 4’s game designers. For Blackmon, it wasn’t just about getting people outside of academia to compose in the journal, but also about how they may be active participants in the review process itself. She noted that in the early stages of the journal, it didn’t click for her immediately that creating a diverse editorial board meant assigning editors who are outside of academia (but may have other areas of expertise). So while the first round of editors were all academics, Blackmon purposely sought out those who wrote about games or developed them to be part of the review process in order to avoid creating another academic gatekeeping process where only scholars are provided the opportunity to judge the quality of others’ work. It’s also important to note that the work of incorporating voices outside of academia wasn’t arbitrary or in any way forced—both issues that may have compromised the ethics of the journal. Since Not Your Mama’s Gamer had already been around for seven years encouraging these intersections, the relationships were already in place and a level of trust had been established with the broader community. Perhaps an important question to ask if academia is to encourage more of these intersections is this: what kind of choices can we make in our work to ensure such communities exist and flourish? And how may these communities lead to spaces for public knowledge-making that is truly collaborative? A key point of the conversation Blackmon and I had centered on the digital affordances of the journal and how those affordances may intersect with feminist composing methodologies. Blackmon mentioned how too often she saw other journals judge content as not viable for publication because it was viewed as too multimodal, too nontraditional, or just too feminist. Instead, she wanted to push against the very conservative, hegemonic, and language-centric practices of traditional academia by making a journal multimodal to a degree that other academic journals hadn’t before—allowing for games, comics, critical lens play, and everything else that is so often viewed as non-academic or even anti-academic. Future and existing journals may want to consider how they could encourage more nontraditional or even experimental content as well as how such content may be valuable in shaping the future of what we count as ethical and credible knowledge-making. It is obvious that journals require deadlines and goals in order to get published. And we have all likely experienced that feeling of you-have-to-get-it-together when a looming deadline comes closer. But if we truly are to enact feminist goals within traditionally academic structures, we must question and challenge Western conceptions of time that always value chronology, strict deadlines, and efficiency above all else. One thing that became clear in my conversation with Blackmon was that NYMG valued—even required—flexible deadlines. And while generally Blackmon aims for the journal to publish four times a year based on U.S. seasons (Spring, Summer, Fall, and Winter), she doesn’t promise the publication of an issue on a certain date. In part this flexibility is a required practicality of the journal: there is so much more that can go wrong when publishing multimodal, digital content across different platforms and mediums than would be the case if the journal was purely text-based or even text and image-based. Flexibility in deadlines provides more time to get those unexpected issues sorted out. This flexibility in deadlines is also part of feminist practice; for instance in NYMG, as Blackmon described in our conversation, if an author needs a few more days, they can have it. And if the content needs a few more weeks, it may be published in the next issue instead. Life circumstances can make it challenging to push through to make certain deadlines, as graduate students, parents, and folks with disabilities are well-aware. For journals to say, “If you don’t have this out and ready by [insert date]it won’t be published” is another way for traditional academic structures to regulate whose voice is heard and whose voice is ignored. I hope in sharing the goals and processes of NYMG I have helped others consider how we push for more inclusive and creative content that bridges the work of academia with the public in intersectional and feminist ways. And I believe, or at least hope for, more variation and different possibilities for the future of academic composing—futures that care for and invite all bodies and their ways of moving through the world to create, to compose, and to dream. This sense of hope—a feminist hope—may be what allows us to bridge our fantasy with reality. I’m excited to see what our DRC readers come up with.